I have a few things in progress, however I’m making lots of plans for the next couple of months. This week will be an overview of things to come including WIPs (works-in-progress), new fabrics for spring and a couple of light fixtures I’m making for the house. I’m not sure which project is the most exciting! First I have two projects I’m working on. I want a little more color in my living room. At the same time my yarn stash of leftover skeins is getting out of control. Yep, an afghan of many Wendy colors! I picked a basket of colors that coordinate with my living room and the lime green patio furniture outside the windows. I rib knit a couple of inches and from there on I’m knitting in garter stitch with a very occasional few rows in stockinette. When I get tired of a color I just switch to something different. I’m not even giving much thought to the weight of the yarns other than doubling some of them at times. One end will have fringe from all of the loose ends and I will need to do some finish on the other end. I might bind that edge with suede, wool, or crochet an edge. Sometimes it’s just relaxing to just knit without having to worry about shaping or fit! 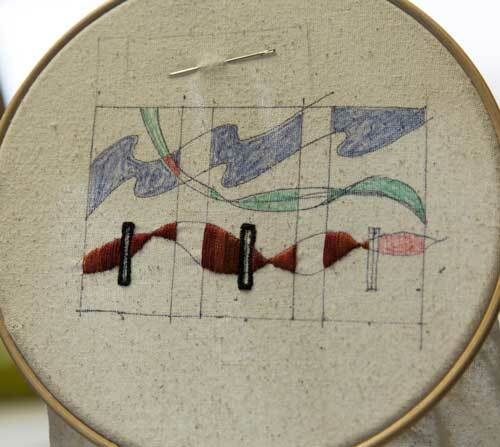 The second work in progress is some embroidery with no plans on where I will use it. I love a little handwork now and then, but when I’m almost finished with a project I can’t get myself to wait for a small labor-intensive detail. I’m making some elements to have on hand to enhance a project when I desire. I may even design something just to use these decorative pieces. Shown here is the beginning of three button-hole tabs for a future jacket or blouse. My spring wardrobe sewing plans are coming together. I just drafted a classic straight pant that I hope will work well with some of my knits. 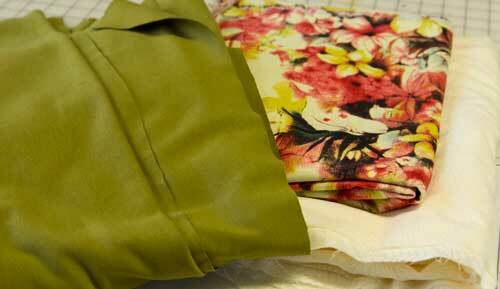 Then I can modify the pattern to work with the linen pants that I love to wear in summer. 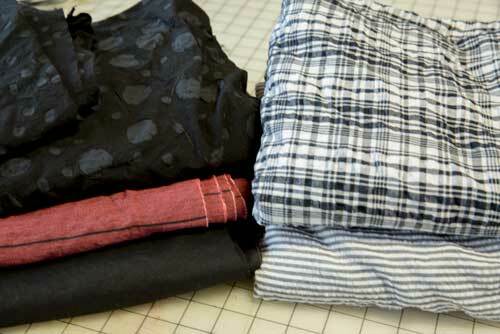 Here are a few fabric combinations that I have grouped together to make outfits. Green knit pants with coordinating floral and solid top options. Thin stripe linen pants with a soft rayon challis for a blouse. Lime green linen pants with a cotton lawn shirt. Black linen pants with a red and black cotton and linen blouse and a stripe and plaid seersucker blouse. 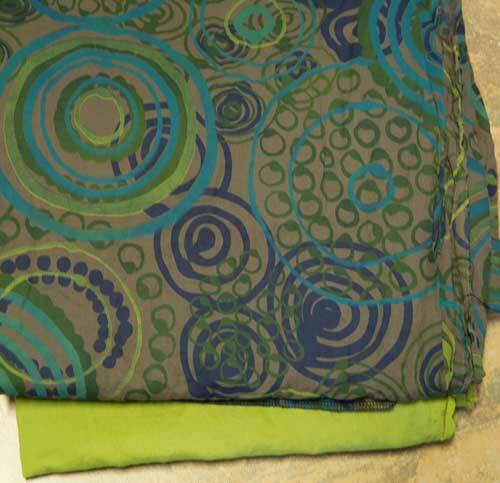 I have more rayon challis coming in with some wild prints for a change. I’m normally a fall color person who struggles with spring/summer colors, but I think the upcoming season is looking up on the wardrobe front! Then I’m making light fixtures. 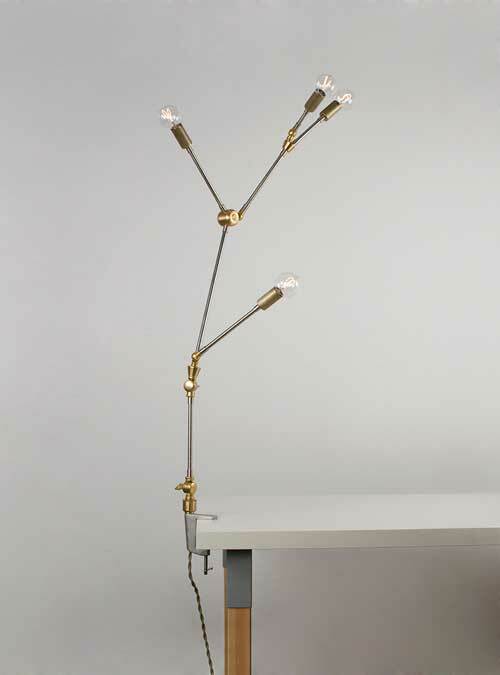 For several years I have admired the work of lighting designer Lindsey Adelman, but couldn’t afford the fixtures. Her fixtures run from around $7,500 to 15,000, but she is now offering directions and supply lists for a cool branch series. 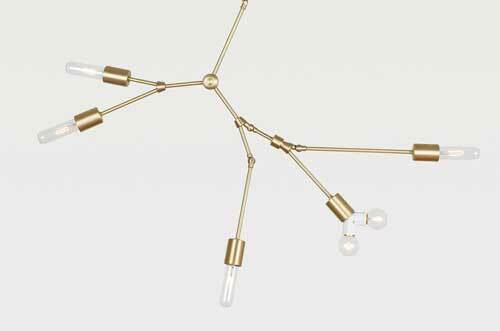 The kit for the chandelier is $145!!!! 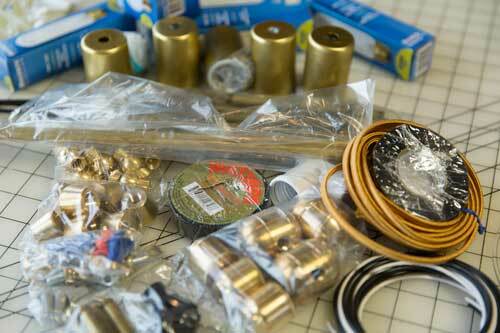 I have parts for the You Make it Chandelier, and two of the You Make it Desk Lamps. So Cool!!!! This entry was posted in For the Home, Knitting, Sewing, Surface Design / Embroidery and tagged Clothing, Embroidery, sewing, Spring sewing. Bookmark the permalink. This post is really inspiring, Wendy! Can’t wait to see your lighting fixture when finished. I’m knitting up my stash, too. 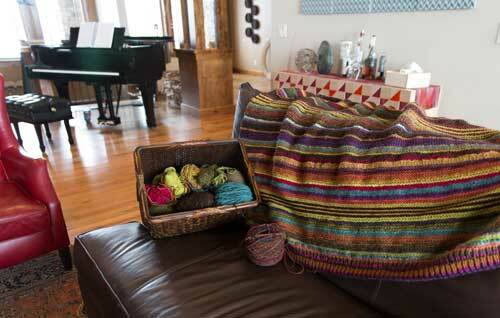 Big, loose, drapy, multi-colored stripped…not sure what it will be though…big shawl…rowana…nap blanket. What a fun blog! Love the creative stream going on from embroidery to chandeliers! Love the lights! Missed seeing you today. Keep current with studio notes, sewing and design ideas and reports from my travels. As a complement to my Newsletter and Facebook postings, this page is an informal way to stay connected.